Learning more about computer applications is just a Saturday away. During the upcoming Spring semester, UL Lafayette is offering a 3-hour credit course in Microcomputer Application in Business on Saturdays. This course is an introduction to microcomputer applications and the use of software packages such as operating systems, word processing, spreadsheets and databases to solve business problems. Pre-requisite or co-requisite for the course is Math 105 or Math 109. 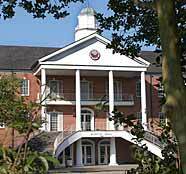 This computer course is taught by UL Lafayette faculty on campus on Saturday from 8 – 10:50 a.m. The 2005 spring semester begins January 10, 2005. University College makes it easy for adults to attend college by offering a simplified special admissions process. If you want to learn something new, register now by calling (337) 482-6729. Staff members can help you enroll and assist you with a plan to meet your higher education needs.